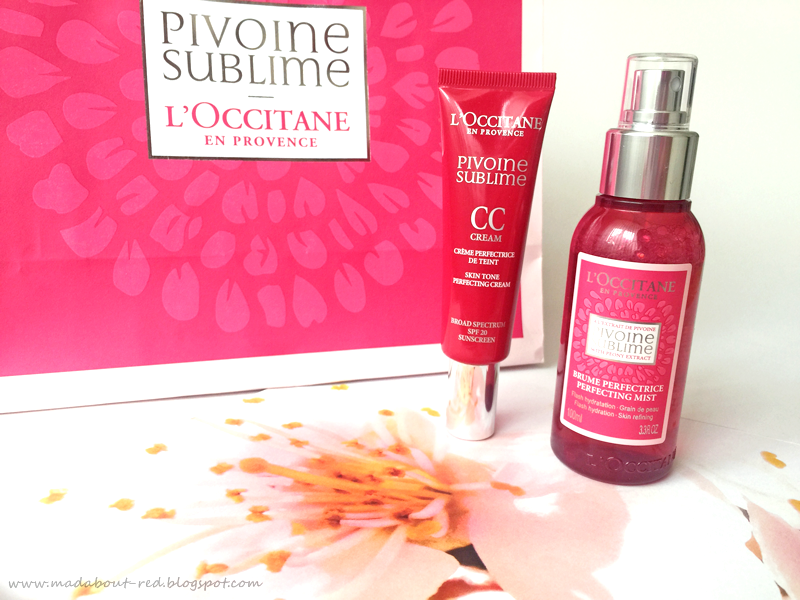 I was super happy when I was invited on L'Occitane facial with their new Pivoine Sublime line. My skin did totally love all the products and it was looking super nice at the end. I bought their Perfecting mist, since I love that kind of products and the CC cream was a gift. Do I need to say that I loved every single L'Occitane products I owned? It's something special about their products. On the other side, the price is not that special. The Perfecting Mist is kind of really perfecting. I don't use it in my face routine, but instead I use it after I apply my make up, and somehow my skin looks more amazing after this mist. The foundation is not caking any more and my pores are less visible. And somehow this mist really gives my skin that healthy glow. Even if I have a make up free day I use it anyway, just because my skin looks better after using it. And make up last longer in combination with this mist. I didn't expect all that benefits from one face mist. But there is one downside, after using it for probably around two moths, my skin didn't improve. So the perfecting effect is only there a few hours after using the mist. But I don't regret buying it, since is perfect make up setting spray. 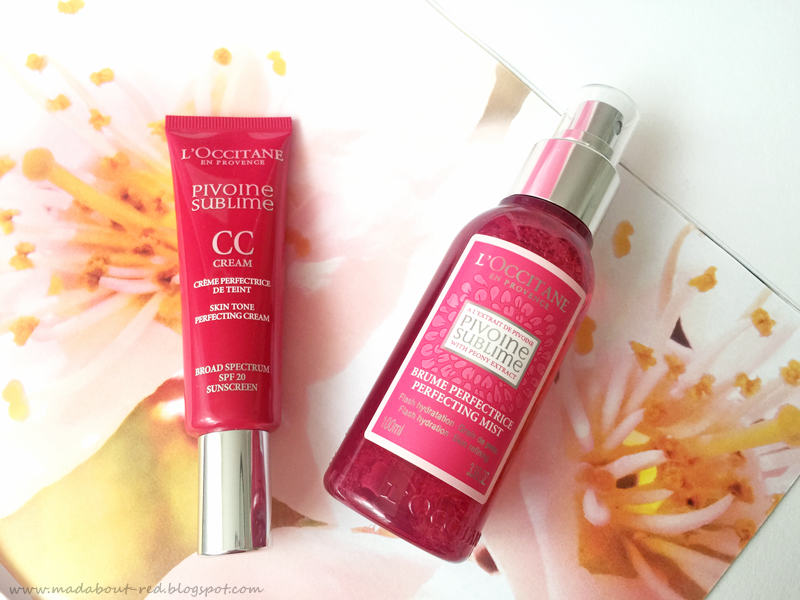 The CC cream is perfect for hot summer days. Light texture and the same perfecting effect. The skin looks fresh and healthy and the skin tone is nicely even out. It has light coverage, my acne still needs a bit of concealer to hide it. I have no idea how that is possible, but my dark under eye circles are less visible with this cream. And it has SPF 30, which is amazing for me, since I don't have SPF cream for my face. I know I am horrible. But I have no idea how my sensitive acne prone skin would go with SPF products. But enough about my skin and problems with SPF. I recommend this CC cream to everyone. In summer time you can wear it alone for a little perfecting effect, but in winter it would be perfect for those with dry skin, under foundation, for additional hydration. This two products are worth a few € to spend on them. I will repurchase this two for sure, but I don't think that will happened any time soon, since I am using them two months now and I only use 1cm of Perfecting mist. Now I need your advice, what is one must have product from L'Oocitane? Super excited to hear your answers. Ojoj skoda res :( ker je tudi efekt zelo lep. Bom vrgla uč na tole masko naslednjič v trgovini.